Every day is a something day, it seems. It's rarely just a Monday, but there'll be a cause or occasion that seizes the day which will, ultimately, pass most of us by. There's even a website dedicated to the idea, unsurprisingly called daysoftheyear.com — no confusion around its intentions, then. What's surprising is that 10th March, the day now well on its way to finishing, is actually 'Mario Day'. It really is, and below is the description telling us why. In recognition of everyone’s favourite pizza-loving Nintendo character, take part in celebrating Mario Day. First appearing in Donkey Kong in 1981, Mario soon became not only the mascot for computer giant Nintendo, but also a worldwide sensation. 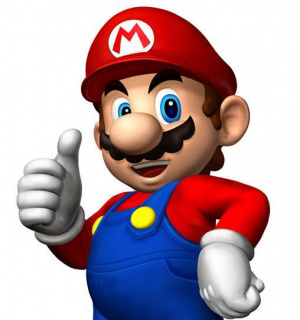 The hugely successful Super Mario Bros. series, featuring Mario and his brother Luigi, defined the 1980’s and the 1990’s and Mario himself still remains one of the most adored, world-renowned computer heroes of all time. So, gather your like-minded, Nintendo-loving friends, don your Mario t-shirts, order in some pizza and get those Nintendo games consoles, Gameboys and DS’s out for a whole day of Mario fun. You could even go one step further and host a Mario House Party! With plenty of ideas, games and activities to choose from, such as fancy dress parties and mushroom stomping competitions, you can be sure to make Mario Day a day to remember. We won't be party poopers and directly point out the incorrect naming and past gen references it's dropping, but we'll award points for effort. Unfortunately we haven't seen any Mario parades near our offices, and haven't heard of a wave of Mario nostalgia taking over the world today. Besides, it's still the Year of Luigi. Sorry Mario. When did Mario ever eat pizza? And Titanfall day is tomorrow! How do you guys not know the real reason for this? Uh, whoa! Ok then, that's cool! @WingedSnagret Well he is Italian. "We won't be party poopers and directly point out the incorrect naming and past gen references it's dropping..."
In all seriousness, this says a lot about the public's image of Mario right now. The newer stuff mights as well not even exist to most people. I failed doing a daredevil run though, but the day is not done. I played a little bit of mk7 so im covered. @ThomasBW84 Haha, we've all been there before. Looking back at my comment, it was kind of condensing. Sorry about that. Cheers to some MAR10 celebration and (calling it now) a Direct announcement tomorrow! @Discipledoctor Oh I know you were just pointing it out Here's hoping for a Ninty Direct this week, I'll be keeping my eye out for the 24 hour warning on Wednesday myself, because of the maintenance timing. Fingers crossed! If thats the case, I declare March 11 as Go Away Mario Day! March 10. Mar10 which spells mario. There are five letters/numbers in the joke. Two of them are numbers. And considering it spells mario. Half Life 3 starring Mario confirmed! What's this blasphemy!? There'll be no celebrations of Mario so long as its still the Year of Luigi! Don't be so hard on yourselves. It makes sense in the US because we put our month before our day. You guys put your day before your month. So, we made the connection to MAR10, but it's difficult to do when your placement is 10MAR. Mario is a computer hero, eh? Mario stays. We love Mario. Mario hates you! So there! Ha... ha.. ok, that was lame. 10 March is my birthday! And this year my wife, ably assisted by my 4 year old son, made me a Mario birthday cake! @Discipledoctor Like seriously. I've been celebrating this for years. Wait, but I have played Mario my entire life and have never seen him eat pizza. Is this some kind of sick stereotypical joke? If it is, I'm not laughing. I hate pizza! For this reason alone, I'll burn down the entire website, which is indeed always the way to end a business as demonstrated in South Park! Well, It's not known if Mario eat Pizza (except in a Mini game in Mario Party 3 XD), but, mushrooms are a well known and tasty ingredient in pizzas, jiji. And next year is Mario's 30th Anniversary. Year of Mario FOR SHO! @WingedSnagret How many Italians don't ? @siconlol you must be adopted then, Italians and Pizza is a rule. Like Mexicans and tacos. Now seriously, happy MAR10 everybody! It's kinda funny, because I just got home from finishing me and my friends' playthrough of New Super Luigi U, and we ate pizza. We also played Nintendo Land. @antonvaltaz Me too! Happy birthday! I celebrated it in Miiverse on PokeloverSaki! Haha! Nah i dont hate Mario, i just think the guy has earned a well deserved rest! @siconlol ouch I get you. I went to Taco Bell once. Just terrible. Maybe I should stop talking about food. It's 1 am and I will get hungry. In Japanese, there are approximately ten billion ways to pronounce every number (or more like... three), so pretty much every single phone number and day of the year gets twisted into some horrible mnemonic device in order to trick you into buying life insurance or puppies or daikon radishes or whatever. @ThomasBW84 Will NL be recognizing this day a bit more "participatorily" for lack of a real word, next year? Whoops! I totally missed Mar10 day. Oh well, I'll try to remember for next year. Today is Marill day! We all celebrate the 183rd blue water mouse thing Pokemon! Computer hero? Mushroom stomping? Pizza? These people have probably never played a Mario game but at least they tried. @siconlol I know what you mean about stale pizza. What there needs to be for us Italians is a real, Italian-style pizza delivery chain, no more of this cheap cardboard stuff... I feel like the only good pizza I've had came from a real pizzeria. I betcha they'd botch up Sonic's day too - eating cheeseburgers instead of chili dogs. @ThomasBW84: Myself and James were on this concept first! Back in March, 2010 (MAR10), I pitched the idea of Mario month to him. He thought it was brilliant, so we reviewed a bunch of Mario games (Sunshine, DX and Dance Dance Revolution included) and made a podcast. You got it from us first! what day isnt mario day?